Kidambi formally trained in classical music, singing works by avant-gardists includingNono and Stockhausen, but the pull of free jazz and Alice Coltrane drew her toward a different path. The influence of both Alice and John Coltrane is especially apparent on the new album, as is her work with composer and saxophonist Darius Jones, and her study of Carnatic music. The forthcoming release From Untruth builds upon the bedrock foundation of Kidambi's previous compositional and conceptual work with Elder Ones, while forging uncharted territory. 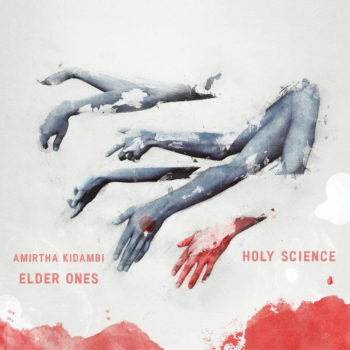 After a journey into wordless abstraction on Holy Science, Kidambi felt the urgency of the political moment required a direct and verbal call to action. The lyric fragments in "Eat the Rich", "Decolonize the Mind", "Dance of the Subaltern" and "From Untruth" critique power structures of capitalism, racism, colonialism and fascism, distilling heavy post-colonial theory into concentrated visceral battle cries. The instrumentation adds a layer of technology as a metaphor for modernity, with Kidambi on analog synthesizer and Max Jaffe's drumming talents extended to electronic Sensory Percussion. The frenzied improvising of Matt Nelson on soprano sax and gravity of Nick Dunston on bass, anchor the music in the tradition of free jazz, while it pushes into new futurist realms. The aesthetic seamlessly reels from modal meditation, atonal expressionism, free improvisation and melodic invention, to unabashed bursts of punk rock energy. This is Elder Ones at an unadulterated breaking point; on the edge of a knife that cuts. Read more 17/10/2017 DUOT & ANDY MOOR "Food"
Read more 01/07/2017 RALPH ALESSI & THIS AGAINST THAT on tour, spring 2018.